Posted on Thu, Mar 22, 2012 : 2:15 p.m. The landlord of the Dream Nite Club obtained a judgment against the controversial downtown Ann Arbor establishment today. According to the judgment, an order of eviction will be issued against the club on April 4 unless the club's owners pay $42,000 in rent owed. Dean Zahn Properties LLC, represented by Ann Arbor attorney Bill Stapleton, is listed as the plaintiff in the order signed by 15th District Court Judge Joe Burke. The defendants named in the landlord-tenant dispute are V.R. Entertainment Inc. and Jeff Mangray. 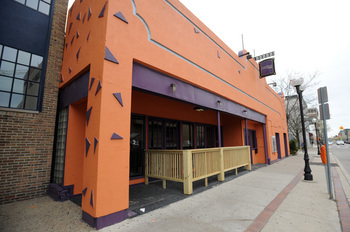 The Dream Nite Club in downtown Ann Arbor could be evicted on April 4 if its owners don't come up with $42,000 in cash. Stapleton could not immediately be reached for comment. Roger Farinha, a Detroit-based attorney for the Dream Nite Club, spoke critically of the city attorney's office for showing up in court today for a landlord-tenant dispute. "It's a clear example of the city attorneys using their powers," he said. "They're involved in every aspect of attacking this club, even to the point of showing up to a landlord-tenant issue." Postema acknowledged Senior Assistant City Attorney Kristen Larcom was present, but only to verify what happened as the city is not a party to the landlord-tenant dispute. The city of Ann Arbor has been fighting to shut down the club on Fourth Avenue following a string of problems over the last year, including stabbings and at least one shooting. The city has a state court lawsuit pending that claims the club is a public nuisance. Meanwhile, the club has filed a federal civil rights lawsuit that claims city officials have made false allegations of illegal activity at the business, subjected it to heightened scrutiny by police and harassed it because its owners and customers are racially diverse. City Attorney Stephen Postema called Thursday's judgment against the business significant in that it could mean the end of the Dream Nite Club. "It's very significant because if they get evicted, then they're done and there's no nuisance," Postema said. "It would theoretically end the city's case." The embattled business has gone through at least four different attorneys as it works through the pending legal cases. The club is in a dispute with one of its attorneys in the state court case who claimed he hadn't been paid several thousand dollars. Farinha is representing the club in the federal lawsuit. Saline attorney David Shand is listed as the current attorney of record in the state court case. Postema said he doesn't see how the club can make some of the claims it's making when it already admitted responsibility and paid $600 in fines in September for the injuries two patrons suffered in fights inside the club last year. State Liquor Control Commission records show the club acknowledged two charges against it in a settlement agreement in September. That includes allowing "annoying and/or molesting" of two customers, Marquis Hargrove and Sean Foster, by an unknown customer. The Ann Arbor City Council voted this week to ask the state not to renew the Dream Nite Club's liquor license. Fri, Mar 23, 2012 : 3:50 a.m. They should have no problem coming up with that money, what, with the amount of money they save on trash pickup. Every other business that shares the alley with them foots that bill in the way of overage charges. Any business sharing that alley can tell you how they watch them distribute their trash between everyone else's dumpsters Saturday and Sunday afternoons. On second thought, perhaps purchasing all of the booze they sell from retail shops is probably a tad more expensive than going through the MLCC and required distributors. You'd be hard pressed to find anyone that's seen a delivery truck pull up to that place. There's a slew of reasons that Dream should go away. Fri, Mar 23, 2012 : 1:09 a.m.
Thu, Mar 22, 2012 : 10:09 p.m. Does anyone remember Maude's restaurant many years ago? I'm not sure why Main Street Ventures closed it, but I certainly don't remember any complaints of crime there. Maybe a restaurant would be better than a nightclub at that location. Thu, Mar 22, 2012 : 11:31 p.m.
Before Maude's it was The Golden Falcon. They would let anyone in, but there weren't fights then either. Thu, Mar 22, 2012 : 9:10 p.m.
&quot;the city is not not a part to the landlord-tenant dispute.&quot; Not a part of? Not a party to? Thu, Mar 22, 2012 : 8:59 p.m. There is still the possibility of a Chapter 11 reorganization petition that would stay any eviction proceedings. There is also a possibility of the District Judge Burke allowing the tenant to remain and pay rent in escrow while an appeal is filed and heard. Thu, Mar 22, 2012 : 8:34 p.m. I for one hope they don't come up with the money...but they will. Thu, Mar 22, 2012 : 8:04 p.m.
How many problems is the city willing to put up with for this place? Whoever owns it, whoever frequents it, whoever causes trouble, it would seem the time has run out. Thu, Mar 22, 2012 : 7:24 p.m.
Thu, Mar 22, 2012 : 7:19 p.m.
Perhaps the building's unfortunate color combination causes people to lash out violently. I know it sets my teeth on edge. Thu, Mar 22, 2012 : 6:53 p.m. Whether the atmosphere of the Dream Nite Club is to one's liking or not, there are simply some facts which are worth looking at in this case. And they go far beyond rent. Facts: There is a case filed. The case no. is 2:12-cv-10203-PDB-PJK, VR Entertainment et al v Ann Arbor City of et al, Filed 1. 17. 2012, Paul D. Borman presiding. The City Liquor Control Commission open meeting minutes from last week contain comments from certain members who express the wish to target The Black Elks, Rush Street and Dream Nite Club for revocation of liquor licenses. Fact: These establishments are owned by and or are magnets for minorities in this area. What does this all mean? You tell me. Fri, Mar 23, 2012 : 12:02 a.m. Rush Street is not a minority establishment. Thu, Mar 22, 2012 : 11:50 p.m. Rush Street is a minority club? That's news to me...... Seems pretty white every time I go in there, and the crows is usually well behaved. The dream night club has violence (fights outside and in the parking structure nearby), open drug use, and complaints on a weekly basis (more so in the summer). The owners obviously aren't doing a good enough job keeping out the riff raff. If the same happens at those other establishments, I might start to question why minority hangouts have this problem.